According to Statistics Finland, the value of new orders in manufacturing was 4.6 per cent lower in August 2017 than twelve months earlier. 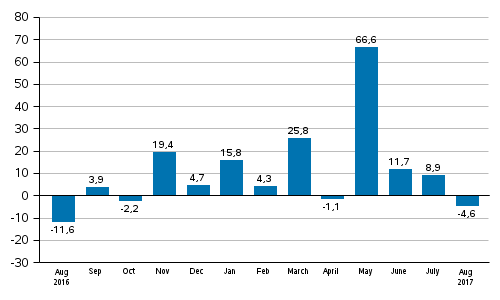 During January to August, orders grew by 15.5 per cent from the year before. In August, enterprises received more orders than twelve months ago in the textile industry, in the chemical industry and in the manufacture of paper and paper board products. In the textile industry, orders increased by 5.7 per cent, in the chemical industry by 1.3 per cent and in the paper industry by 1.3 per cent year-on-year. In the metal industry orders decreased by 7.6 per cent from twelve months ago. ISSN=1798-6737. August 2017. Helsinki: Statistics Finland [referred: 19.4.2019].